Today Kansas Secretary of State Kris Kobach reappointed the current Johnson County Election Commissioner, Brian Newby, for another four-year term. The swearing-in ceremony took place in Secretary Kobach’s office in Memorial Hall. 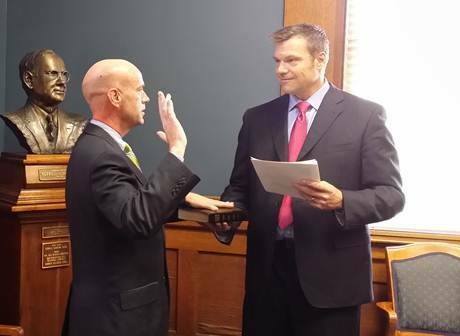 Newby was first appointed by Kansas Secretary of State Ron Thornburgh in January 2005 to fill an unexpired term, was reappointed by Thornburgh in 2006, reappointed by Secretary of State Chris Biggs in 2010, and served under Secretary Kobach before today’s swearing in. Just recently Newby earned the Minute Man Best Practices of the Year Award from the National Association of Election Officials for ‘iPad, iRegister’ which uses an iPad to document proof of citizenship and photo identification for newly naturalized citizens registering to vote. The same initiative resulted in his receiving the Making Democracy Work award from the Johnson County, Kansas, League of Women Voters. Last year the National Association of Election Officials bestowed the Guardian Best Practices of the Year Award for the online ‘Election Diary,’ Newby’s widely-read blog focusing on the day-to-day operation of administering elections. Newby serves on the Election Center Legislative Committee, is a member of the International Association of Clerks, Recorders, and Election Officials and is a former board member of the National Association of County Records, Election Officials, and Clerks. The secretary of state’s office is charged with the responsibility of overseeing Kansas elections. While 101 counties elect their election officers (the county clerks), the four largest counties in Kansas have election commissioners who are appointed by the secretary of state. Congratulations to Brian and here’s to at least four more years of top-notch electiongeekery! Be the first to comment on "Cream Rises: Brian Newby Reappointed as Johnson County Election Commissioner"